So after the last installment, I actually raced through the next 80 pages or so in two days, and my brain was overflowing with things to say about them, but life has a frustrating way of proving that the things you are excited about doing are, as the government shutdown managers would put it, non-essential. But here we go. I’m now halfway through the book, and have finished all of Part 1, Bruegmann’s history of sprawl, which is a nice place to stop and reflect before going on to new themes. These last 80 pages largely pick up where the Introduction and beginning chapters left off, which is assembling the evidence that sprawl is a normal (in the sense that it has occurred in every era of human history, and in nearly every civilization), and healthy, process for economically maturing cities to go through, and that most of the received wisdom in urbanist circles is either exaggerated or entirely false. It’s an odd and frustrating read, alternating between important and incisive critiques of anti-sprawl motifs – usually cultural or aesthetic – and factual claims that it’s hard to believe the author believes accurately represent reality. It feels a bit too often like the presentation is being shoehorned into the thesis, and there are a few moments when the author sort of winks at the reader – so fast you could miss it if you weren’t looking – to indicate that he knows he’s not being entirely fair. More on that next time. 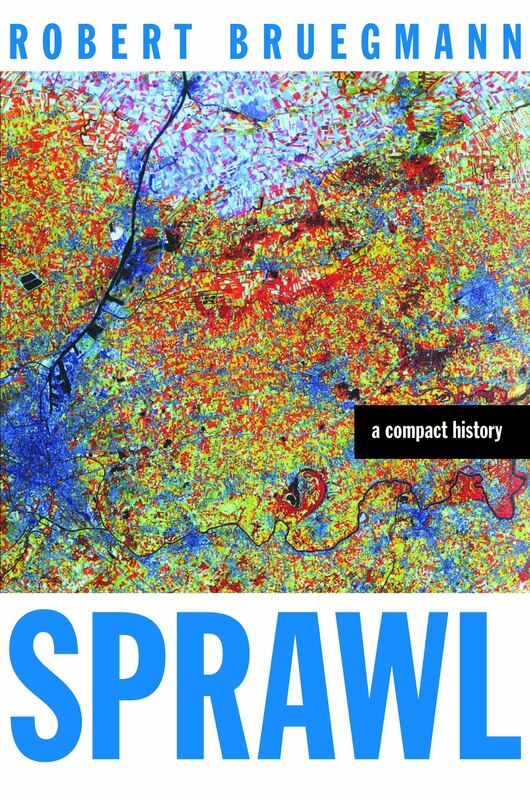 This time, just a few notes on Bruegmann’s “history of sprawl,” which takes up the rest of Part 1. Bruegmann tries to take on the popular urbanist narratives about the causes of urban sprawl; I guess it’s worth reminding people about the big picture, or part of it, which is just economic growth: People consume more resources (i.e., a car, a detached house) because they can. For most people, making the jump to a single family home and their own car is a triumph. B. is right that urbanists who don’t want to be assholes shouldn’t sneer at that, whether or not those are the material things they happen to prize most. But we need to be careful about writing things like: “Another common explanation of…the rise of sprawl is that it was caused by white flight fueled by racism. Although no one would deny that race has played a key role in many aspects of American life, it is significant that urban areas with small minority populations like Minneapolis have sprawled in much the same way as urban areas with large urban areas like Chicago.” First, it is unfortunately characteristic for Bruegmann to dismiss the entire history of race-based urban policy with the single clause quoted here. (This is the sort of wink that suggests B. actually knows the immensity of what he is omitting, but it is not fair to assume that all of his readers do.) Second, this book’s perpetually loose definition of “sprawl” is doing an awful lot of work here. It is certainly true that the growth of suburban-style communities did not anywhere depend on racial animosity. But it’s also true that the counterpoint to the growth of those communities – that is, the collapse of inner-city communities – is highly correlated with racial politics. The parts of inner-city America that have had catastrophic population declines are, in fact, largely those neighborhoods that became segregated black ghettoes during the first or second Great Migrations. Given that Bruegmann has taken pains elsewhere to point out that suburban sprawl has had effects on urban neighborhoods, it’s curious he doesn’t feel the need to make that point here. About claims that government policies – redlining, highway construction, zoning, and so on – have furthered sprawl, Bruegmann says: “None of these arguments are very convincing.” But he brings up arguments about transportation spending and highways during his discussion of federal influence, and dismisses them by pointing out that state and local governments had plans to build even before federal money came; then when he gets around to talking about state and local influence, he forgets (?) to bring the subject up again. Bruegmann claims that “the self-amortizing mortgage…could have benefited any homeowner, whether in the central city or suburbs,” before admitting only a few lines later that in practice, banks refused to lend to “poor and racially changing neighborhoods,” and then justifying it by claiming that “a great deal of evidence [indicates] that property values did tend to drop as neighborhoods got older and experienced ethnic or racial turnover.” Well, yes. But why did those prices decline? Because in the context of mid-20th century America, a “changing” neighborhood meant a place that, in a matter of a few years, would be an all-black ghetto deprived of capital and given inferior city services. Because of, you know, racism. And, in fact, nearly the entire central cities of many American metropolises were redlined on those grounds during that period, up through the 1960s. How exactly does this jive with the claim that race played little role in the decline of urban areas? Staying on the subject of government influence, what is with the admission – again, given a single sentence – that “in city after city across the country, old zoning codes have been downzoned time and again to reduce the ultimate possible population and prevent existing densities from rising”? Should that not maybe come up when we use changing population patterns as the evidence for people’s “preference” for sprawl? If cities have capped their populations, that would seem like a relevant confounding variable. The book continues to suffer from not considering the idea – which is not exactly obscure – that car-dependence is a line, maybe the only one, that very clearly divides one type of development from another. As a result, a lot of arguments get confused. For example, at one points he claims that cars can’t possibly cause sprawl, because “the Los Angeles region has become dramatically denser since the 1950s in an era when the vast majority of people have relied on the private automobile.” It’s true that there isn’t any linear relationship between car-reliance and low population density (look at Houston); but that doesn’t mean cars are irrelevant. There is absolutely an upper limit to the density at which cars can function in any kind of efficient manner, and designing for maximum car efficiency almost always makes it much more difficult to design for efficiency or safety for pedestrians and public transit users. There is absolutely a trade-off involved, and one that has very serious consequences for the low-income and anyone else who can’t or doesn’t want to drive; but Bruegmann’s resort to population density as the ultimate arbiter of sprawl in this case papers that over. Later, apparently deciding that cars are a good proxy for sprawl – this sort of goalpost-moving, depending on what point needs to be made, is annoyingly common – Bruegmann argues that the advent of personal automobiles is a good thing, since it improves mobility and “allowed a dramatic expansion of educational and employment opportunities.” Maybe. But why doesn’t he even mention the difference between mobility (how much physical ground you can cover) and access (how many resources you can get to)? Cars absolutely improve mobility, but highly car-dependent development tends to work against access, since residential, institutional and commercial uses are separated and you have to cover much more physical ground to get to them than you do in an urban area where the pharmacy, grocery store and neighborhood school are all within half a mile of your house. The costs of car-based mobility are also radically higher than any other form of urban transportation, which reduces access to anything that requires the money you just spent on insurance and gas. And none of this applies to people who can’t or choose not to drive because of their age, disability, or income level, whose access and mobility are dramatically cut down by car-dependent development. That’s how you get a situation where the average low-income person in the Chicago metro area can only get to 14% of the region’s jobs within a 90 minute public transit commute. I don’t mean to be quite so relentlessly negative; this is still a book worth reading, especially if you feel yourself nodding along with most of my criticisms, because it forces you to consider which of your feelings are cultural prejudices, and which are actually linked to some non-aesthetic conception of the good. I’m generally on board with the American liberal idea that the freer people are to choose how they want to live their lives, the better, and my own ideas about the good life shouldn’t matter in those calculations. It’s worth remembering, if you feel the same way, that suburbanization, broadly speaking, enormously increased the average person’s choices about how to live. But it’s also worth remembering – if you find yourself nodding along more often with Sprawl – that car-dependent development has had a dramatically shrunk the options available to many other people. The way forward, I think – and so far I’m disappointed that Bruegmann hasn’t moved this direction – is to acknowledge that the argument should not be between urban elitists and defenders of the status quo. It should be about finding the policies that best allow people to live their lives the way they want. Ultimately, single family homes and decent public transit access are not mutually exclusive. More on that in future installments. Previous Previous post: An evilness still possesses this town and it continues to weigh down my heart.